As the Evil Dead remake arrives on DVD and Blu-Ray, we cannot recommend the film enough. Jane Levy stars in the film that made Sam Raimi the director he is today. Evil Dead stars Jessica Lucas and Lou Taylor Pucci talk exclusively about making the horror remake and what truly scares them. Lucas and Pucci also chime in on what it means to them to be a part of the Evil Dead universe. Evil Dead fans rejoice! Our Evil Dead review can firmly state that the remake is one terrific and terrifying ride. 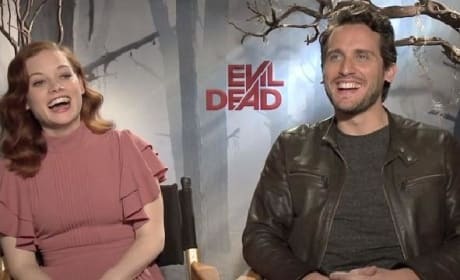 The Evil Dead director Fede Alvarez and star Jane Levy exclusively talk about why the Evil Dead movies have been so popular for 40 years. Levy also dishes why she had nightmares while filming. The star of the original Evil Dead, Bruce Campbell, gets some serious love from the remake's Jane Levy and Jessica Lucas. 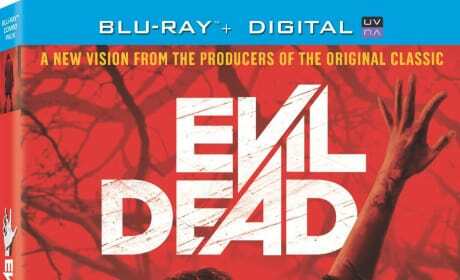 Levy and Lucas star in the Campbell-produced update of Evil Dead and tell us exclusively about it. Jessica Lucas turns evil in this clip from Evil Dead. Jane Levy, Shiloh Fernandez, and Lou Taylor Pucci also star in the horror remake. Check out a batch of new stills from Evil Dead. The horror remake stars Jane Levy. Check out a new clip and a WonderCon teaser for Evil Dead. The horror remake premieres April 5. The new TV spot for Evil Dead shows off fan reactions. The horror remake is directed by Fede Alvarez. Check out a new poster and new pictures from Evil Dead. Fede Alvarez directs the remake of the horror cult classic. Four friends travel to a cabin in the woods where they discover a book that unlocks a demonic presence in this remake of the 1981 cult classic.